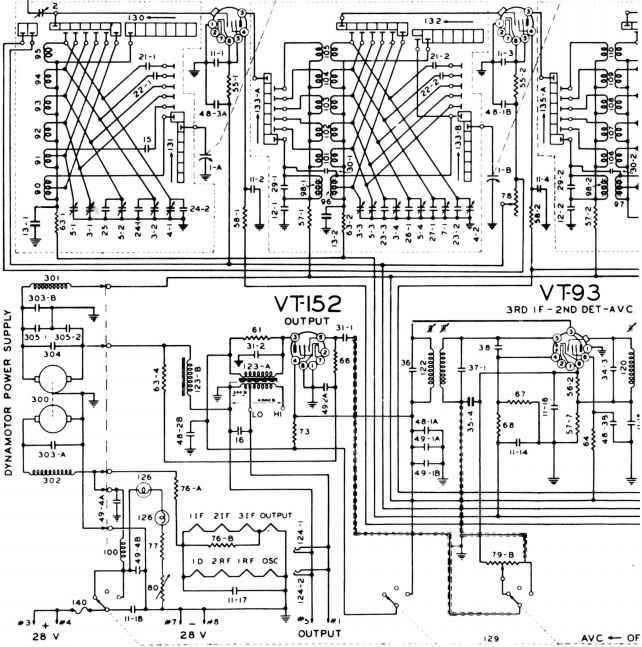 This receiver has the usual stages of a communications receiver, as you can see in the diagram at the right. The BFO is combined with the second IF in a single stage with a single tube for both circuits. Another single tube combines the third IF, detector, and AVC circuits. right. The main tuning dial is at the upper center of the central panel. The bandswitch control is at ihe bottom of the dial mounting, and the control is below and to the right. The dial lights control, at the top right, regulates the intensity of the light behind the dial. It is provided with an off position. At the lower right are the antenna and ground terminals, marked A and G. The control directly above is for alignment of the receiver input circuit with the antenna. At the left hand side of the control panel is a toggle switch to provide use of the BFO. Beside it is the crystal control, used for connecting the crystal filter for CW selectivity. Below the toggle switch is a three-position switch which turns the receiver on by selecting either AVC or MVC. Beside this three-position switch is the volume control. On either AVC or MVC, it can be adjusted to regulate the output. On AVC, the volume control provides manual volume control to regulate the output level. On MVC, the volume control provides manual gain control. 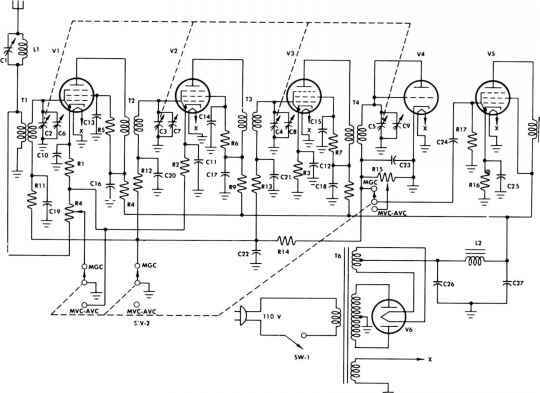 At the side of the volume control is the BFO control used to regulate the frequency of the beat oscillator. Two head set jacks marked TEL, provide for connection of two headsets. The dynamotor in the center of the photo provides power for the transmitter. 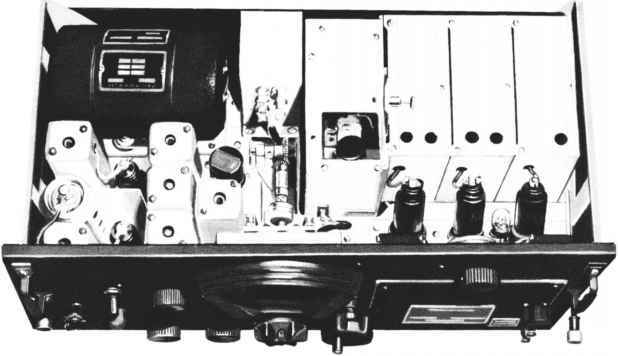 The receiver dynamotor is housed in the receiver unit, as shown in the illustration of the receiver on page 79. In the upper right hand corner are three shielded compartments each containing six RF tuning coils for the six tuning bands. The fourth compartment houses the HFO and its tuning coils. In the lower left hand corner are the shielded IF transformers. The gear arrangement for the band change mechanism can be seen in the center. Behind the gears is a shielded compartment containing the audio output transformer and the audio choke for the power supply filter. capacitors are numbered 1-A, 1-B, 1-C, and 1-D. The voltage regulator circuit, at the right end of the second row of tubes, regulates the high voltage supply of all the tubes. The second IF amplifier uses a multielement tube which also serves as the BFO tube. Another multielement tube serves as both the third IF amplifier and the detector-AVC tube. Thus, the number of tubes is held to the minimum necessary for effective operation. This is in line with a general policy of keeping airborne equipment as light and as compact as is practicable. Note that there is no noise limiter or squelch circuit. Note, too, that the delayed AVC circuit follows the point where the BFO voltage is introduced.